Cold-weather baseball teams aren’t supposed to have the kind of success Jim Penders has had in his 14 seasons as head coach of the Huskies. It’s in his DNA, other coaches insist — and they may be right. 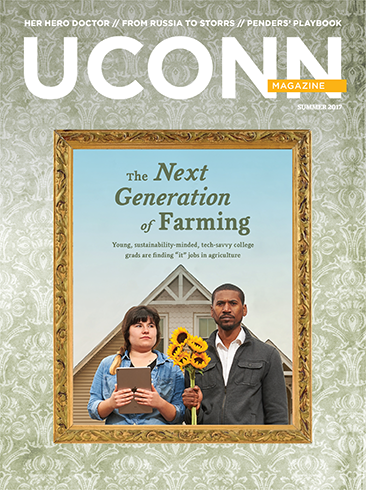 Baseball is in the blood of UConn Huskies baseball coach Jim F. Penders ’94 (CLAS), ’98 MA — not just figuratively but also, one may argue, literally. From top, photos Penders keeps on his desk: Dad Jim E. ‘66 (ED) and Uncle Tom ‘67 (BUS) on the Huskies’ 1965 College World Series team; Grandfather Jim coaching Stratford High; maternal Grandfather Sal Cholko. His father, Jim E. ’66 (ED), a four-time championship high school baseball coach and national coach of the year at East Catholic High School in Manchester, Connecticut, and his uncle, Tom ’67 (BUS), who would coach four different Division I teams to the NCAA Basketball Tournament, played together on the Huskies’ 1965 College World Series team. 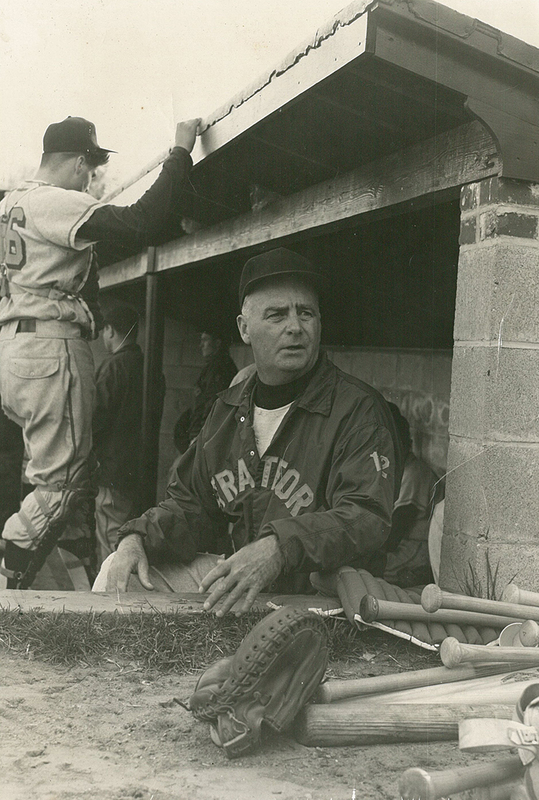 His paternal grandfather, Jim W., was the longtime championship baseball coach, with four state titles, at Stratford (Connecticut) High School, where the playing field at Longbrook Park now bears his name. 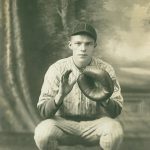 In the 1930s, Coach Penders’ maternal grandfather, Sal Cholko, was a catcher for the state’s American Legion Baseball championship team and later played in the Bridgeport Industrial League. And his brother, Rob, serves as the baseball coach at Division II St. Edwards University in Austin, Texas. 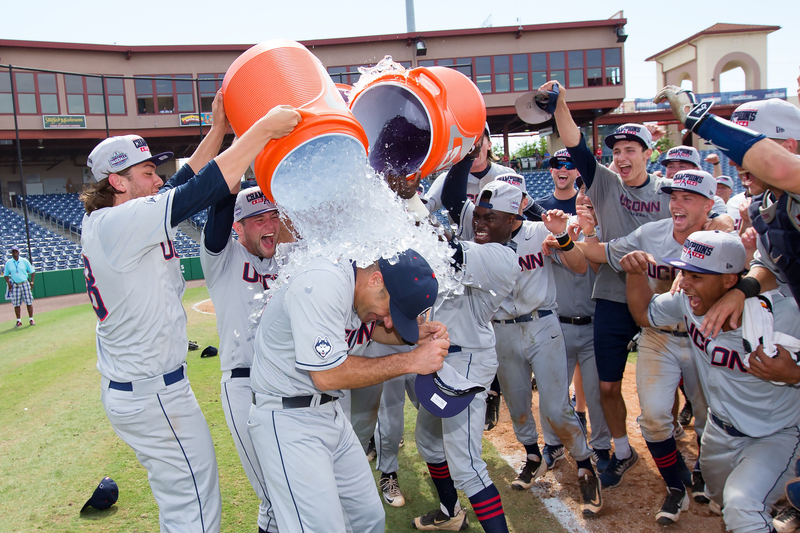 Now in his 14th season as the Huskies’ head coach, Penders will have been part of UConn baseball for 25 of the past 27 years — as a student-athlete, assistant coach, or head coach. He is a four-time conference Coach of the Year who has led the Huskies to 30 or more wins in 11 of 13 seasons, while developing 39 players either drafted or signed by professional baseball teams — including nine who have won All-America honors. In 2016, the Huskies won their first American Athletic Conference title and made their fourth NCAA Tournament appearance in the last seven seasons despite being a cold-weather team competing against conference opponents based in primarily warm-weather locations. Penders’ record of 477-336-4 is second only to that of his mentor, Andy Baylock (556-492-8), who coached all of the Penders men during his long career as Huskies head coach. Better memories began to take shape as Penders started to play the game himself. He and his younger brothers, Mike and Rob, organized neighborhood Wiffle ball games in the backyard of their home in Vernon. They made a field by putting up fences, foul lines, and a scoreboard, even improvising a public address system to announce the game using walkie-talkies. After East Catholic games, where they served as batboys, the Penders boys would quickly move onto Eagle Field and run around the base path while their father took down the American flag before speaking with news reporters. 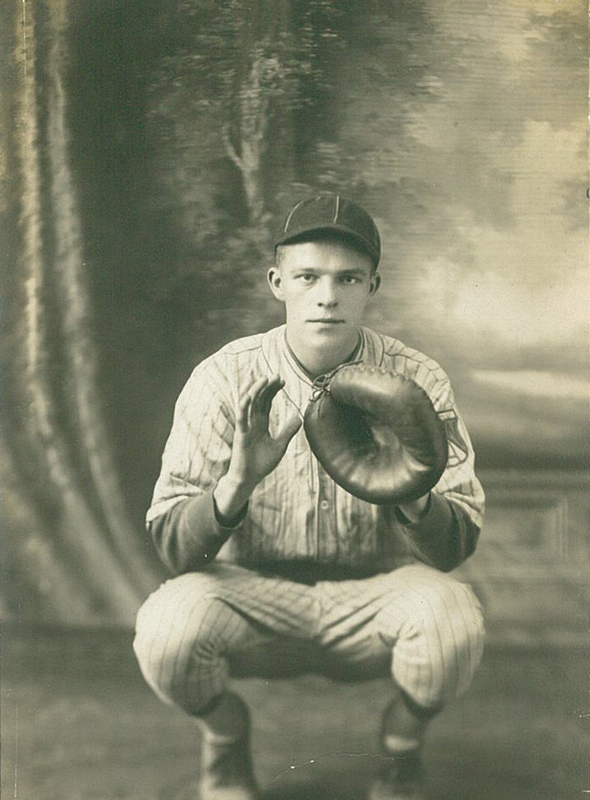 And though there were always used bats, balls, and gloves around the Penders house, the coach living there never put pressure on his boys to play the sport. Penders doesn’t remember his father giving him any instruction in the game of baseball until he was his player as a freshman in high school. “He made his sons seekers by not shoving it down our throats. We always emulated him, wanted to please him, but it was never that push. He told us to study and do well in the classroom. That’s where he pushed us, but never in athletics,” says Penders. An all-state catcher at East Catholic, where he also served as senior class president, Penders went on to become a four-year letter winner for the Huskies and a co-captain for the squad that won the Big East Conference tournament. 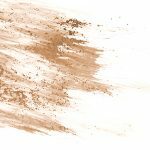 He played in the NCAA championships his junior and senior years and earned First Team All-Northeast, All-New England, and All-Big East honors during his senior season, when he hit .354 with seven home runs and 46 runs batted in. Between his junior and senior years, Penders served as an intern for U.S. Rep. Sam Gejdenson of Connecticut and, after graduating with a degree in political science, he returned to Washington, D.C., to work as a political fundraiser for U.S. Sen. Tom Harkin of Iowa. During that time he met President Clinton. However, he soon found himself thinking about baseball. He called his former coach, Baylock, asking whether he could be a graduate assistant coach. Baylock knew the family coaching history, had coached Penders’ father and uncle, and recognized Penders’ commitment to academics. 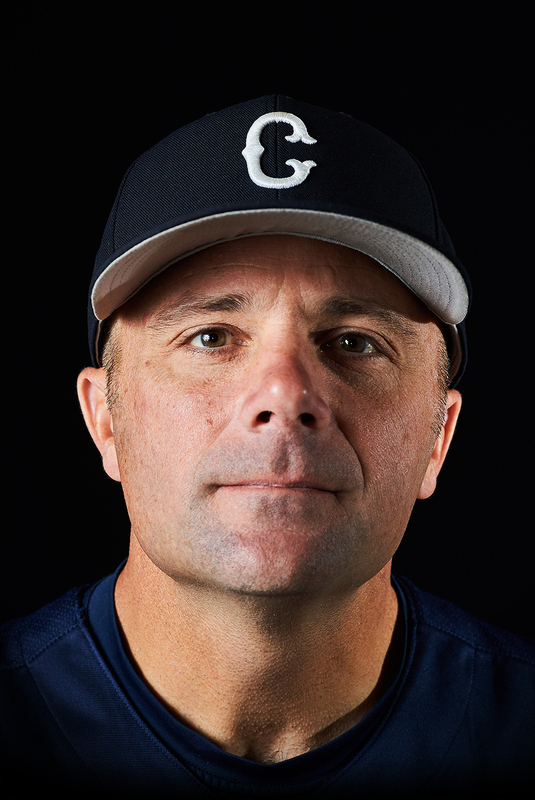 The timing turned out to be right, as part-time UConn assistant coach Marek Drabinski ’90 (BUS), ’94 MA, who played two years in the Atlanta Braves organization, had just been hired as head coach at Brown. Penders returned to Storrs as a graduate assistant coach while pursuing a master’s degree in education. Two years later, he became the Huskies’ first full-time assistant baseball coach. For the next seven years, Penders recruited student-athletes, served as hitting coach, and worked with catchers and outfielders. 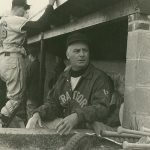 When Baylock decided to step down as head coach in 2003, Penders moved to the next seat over on the dugout bench. Come inside the office of four-time conference Coach of the Year, UConn Huskies baseball coach Jim F. Penders ’94 (CLAS), ’98 MA, and explore the rich history of the UConn Huskies baseball program. He knew there would be mistakes to learn from, none more memorable than in Jacksonville, Florida, during one of his first road trips as head coach. Preparing to play against Ohio State, a Top 25 team that year, Penders set his two lineup cards — one for a right-handed pitcher, one for a left-handed pitcher. Former Huskies baseball player Delroy Parkinson ’87 (BUS), ’93 MBA, who lives in the area, stopped by for a short chat, just before Penders learned that the Huskies would face a right-hander. Penders gave a lineup card to the umpire, and the game started. The Huskies scored on a two-run double in the first inning when the Ohio State coach walked out to home plate and began talking with the umpire. Penders had handed the umpire the batting order for the left-handed pitcher, sending up batters in the incorrect order according to the official lineup card. The runs would not count, and the inning was over. The Huskies quickly took the field so that Ohio State could bat. Penders has turned such hard-won lessons into a coaching philosophy his student-athletes know as ACE — Attention, Concentration, and Effort — that has resulted in five former Huskies currently on the rosters of Major League Baseball teams and five in the minor leagues. 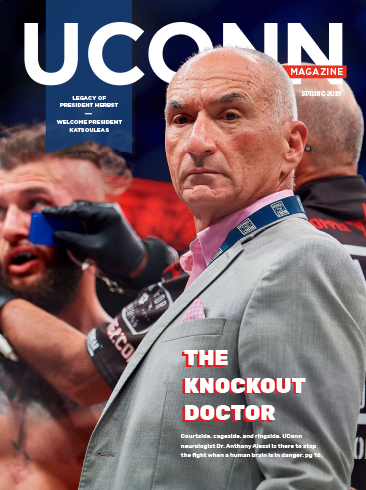 The motivational speeches Penders delivers also can result in some memorable events, such as the one several former Husky players recall taking place in Florida during the Big East Conference tournament after Penders was named Coach of the Year. As the team bus was heading back to the hotel, the head coach told the driver to stop on the small bridge they were crossing. He stood in the front of the bus, holding up the trophy he had just received, and said, “I don’t give a [expletive!] about this award! I want the trophy that says we won the tournament!” He then got off the bus and threw the trophy into the water, filling the bus with laughter. Penders led the Huskies to their first-ever American Athletic Conference crown last season, finishing 38–25 en route to their fourth NCAA Tournament appearance in the last seven seasons. Four Huskies were drafted to MLB teams in 2016, including All-American Anthony Kay, who went 31st overall to the New York Mets. All told, Penders has had 39 players drafted or signed by professional baseball clubs. Huskies field hockey coach Nancy Stevens and women’s basketball coach Geno Auriemma, both Hall of Famers in their respective sports, have observed Penders as he has taken the baseball program toward higher levels of success and national recognition. 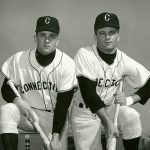 Penders embraces the responsibility of being part of the legacy of both Connecticut’s baseball history as well as the state’s flagship university. That was evident in 2010 following a loss to the University of Oregon in the first round of the NCAA baseball tournament, which included the Huskies’ first NCAA post-season win since 1979. He began his press conference talking about the history of baseball in Storrs and the brothers who donated their farmland to begin the agricultural school that would evolve into the University of Connecticut. Penders’ insistence on hard work and accountability is not just for his players; it also is for his coaching staff and, most important, himself. He says there is a reminder of that expectation each day when he puts on his baseball uniform, No. 16, to coach his team. Most college athletes choose a uniform number worn by a parent or older sibling, a favorite professional athlete in the sport, or the number they wore in high school. 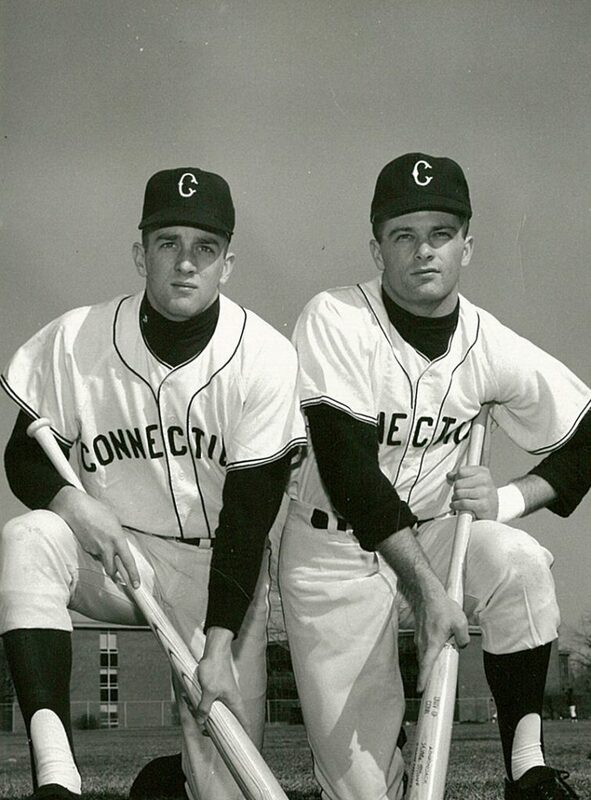 As a UConn freshman, Penders asked to wear No. 15, the number worn by New York Yankees catcher Thurman Munson, his favorite player growing up. Learning it belonged to another Husky player, he asked the veteran equipment manager for any odd number — but nothing with the No. 6, a number he disliked. The next day, he found a uniform hanging in his locker with No. “16” on it.